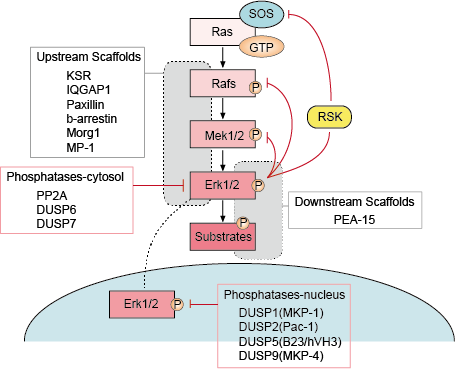 The extracellular-signal-regulated kinase (ERK) pathway is one of the major signaling cassettes of the mitogen activated protein kinase (MAPK) signaling pathway. The ERK cascade is activated by a variety of extracellular agents, including growth factors, hormones and also cellular stresses to induce cellular processes that include mainly proliferation and differentiation, but under some conditions also stress response and others. The main MAPK/ERK kinase kinase (MEKK) components are the Raf family members Raf-1, A-Raf and B-Raf that phosphorylate two serine residues on the MAPK/ERK kinase (MEK) components MEK1/2. ERK1/2 are responsible for stimulating the downstream effectors, many of which are transcription factors. One of the major transcription factors is cyclic AMP response element-binding protein (CREB). • Activation of phospholipase A2 (PLA2) in mast cells. The activation of the ERK1/2 cascade is mostly initiated at membrane receptors, such as receptor Tyr kinases (RTKs), G protein–coupled receptors (GPCRs), ion channels, and others. These receptors transmit the signal by recruiting adaptor proteins (e.g., Grb2) and exchange factors (e.g., SOS) that, in turn, induce the activation of Ras at the plasma membranes, or membranes of other organelles. The activated, GTP bound Ras then transmits the signal by activating the protein kinases Raf-1, B-Raf, and A-Raf (Rafs) within the MAP3K level of this cascade. This activation occurs by recruiting Rafs to the membranes, where they are then phosphorylated and activated. MOS is another MAP3K of the ERK cascade, but it operates mainly in the reproductive system by a distinct mode of regulation. From the MAP3K level, the signal is then transmitted down the cascade through the MAPKK components: MEK1/2. They are activated through serine phosphorylation at the MAPKK-typical Ser-Xaa-Ala-Xaa-Ser/Thr motif in their activation loop. In turn, MEK1/2 activate their only known substrates, native ERK1/2, which function as their sole downstream targets, suggesting that the MEK1/2 serve as the specificity-determining components of the ERK1/2 cascade. The MEK1/2 are the only dual-specificity protein kinases that can phosphorylate both regulatory Thr and Tyr residues of ERK1/2. About 200 distinct substrates of ERK1/2 have been identified to date. They are substrates either in the cytosol (e.g., PLA2 RSK), or upon translocation, in the nucleus, including transcription factors such as Elk1, c-Fos, and c-Jun. Raf-1 is the best studied of the growth factor signaling molecules at the MAP3K level of the cascade. It is a 70- to 75-kDa protein serine/threonine kinase, which contains a kinase domain in the COOH-terminal half of the molecule and a regulatory domain occupying the remainder. On stimulation with various mitogens, Raf-1 undergoes transient activation within 2-3 mm. The mechanism of activation of Raf-1 has been studied extensively over the past few years. It is now clear that Raf-1 is located downstream from HAS, which seems to interact directly with the NH2- terminal portion of Raf-1 on stimulation. The MEKs constitute an evolutionary conserved family of protein serine/threonine kinases that to date includes three highly homologous (85%) mammalian isoforms. The mechanism of MEK-1 activation involves protein phosphorylation on serine residues only and seems to be similar whether phosphorylated by MEKK, Raf-1, or by auto phosphorylation, as determined by phosphopeptide maps. MAPKKs (MEKs) are highly specific for the downstream components ERK-1 and ERK-2. Moreover, MAPKK failed to recognize either the denatured form of its substrate or peptides containing the phosphorylation sites in ERK, indicating that the enzyme requires the native form of MAPK. Because of their high degree of similarity, ERK-1 and ERK-2 are usually considered to be functionally redundant. The main upstream mechanism leading to the phosphorylation of ERK-1 and -2 on both of these regulatory residues is their phosphorylation by MEK. Because of the rather broad nature of its substrate recognition, the ERKs can phosphorylate a large number of proteins after their activation. These proteins are often regulatory in nature and are located both in the cytoplasm and the nucleus. Activated ERK1/2 phosphorylates RSK and both RSK and ERK translocate to the nucleus where they activates multiple transcription factors such as CREB, Fos and Elk-1, ultimately resulting in effector protein synthesis and causing changes in cell proliferation and survival. CREB (cAMP response element-binding protein) is a cellular transcription factor that can enhance the gene transcription for above 10 times. c-fos is a 380 amino acid protein with a basic leucine zipper region for dimerisation and DNA-binding and a transactivation domain at C-terminus. It is involved in important cellular events, including cell proliferation, differentiation and survival; ETS domain-containing protein (Elk-1) is a protein that in humans is encoded by the ELK1 gene. Elk-1 functions is also as a transcription activator. ERK1/2 activation promotes metaplasia and tumor development by phosphorylating Bim and Bid and causing the proteasome degradation of Bim and the sequestration of Bad to the phosphoserine-binding proteins and, thereby, inhibiting apoptosis. In a separate pathway, ERK1/2 activation phosphorylates FOXO3a at Ser 294, Ser 344, and Ser 425 and facilitates FOXO3a-MDM2 interaction. This interaction enhances FOXO3a degradation through a MDM2-dependent ubiquitin-proteasome pathway, leading to tumor development. Signaling by receptor tyrosine kinases that activate the Ras/Raf/MAP kinase pathway regulates development and differentiation of many types of cells. Mainly through the activation of the signal transducers and activators of transcription proteins (STATs). Cdc25 activates cyclin dependent kinases by removing phosphate from residues in the Cdk active site. It is known to control the transitions from G1 to S phase and G2 to M phase. Erk1/2 can activate Cdc25 protein and in turn promote the cell cycle progression. The regulation of Erk signaling is very important for us to maintain the normal function of cells. There are multiple regulation strategy for the cell to regulate the Erk signaling pathway, mainly include regulation by feedback loops, by up and down stream scaffolds, by phosphatase and inhibitors of Erk signaling pathway. There are several points of negative feedback in the ERK pathway (Figure 1). MEK is one target and can be inhibited by ERK phosphorylation of MEK1/2 at Thr292 and Thr212. Phosphorylation prevents further enhancement of MEK activity by PAK1 and thereby reduces activation of ERK. Phosphorylation of Raf at multiple sites by ERK provides a second possible feedback loop mechanism. Hyper phosphorylation of these sites prevents Raf interaction with the Ras GTPase and promotes its dephosphorylation by the phosphatase PP2A. The activation or transcriptional upregulation of phosphatases by ERK is an alternative negative feedback mechanism. These various ERK activated negative feedback loops provide one means by which to limit signal duration and to return the pathway to the basal state. Scaffold proteins bind two or more components of a signaling pathway to bring them into close proximity and thereby facilitate their functional interaction. In addition, scaffolds can target these multi-enzyme signaling modules to different cellular locations and thereby enhance phosphorylation of a specific subset of down-stream substrates. Scaffolds also affect the duration of the signal, prevent crosstalk among similar pathways, and can link the activation of the signaling module to a specific upstream activating signal. The activity of the MAPK pathways is determined by the competing actions of upstream kinases and inhibitory phosphatases. The MAPK pathways are terminated by dephosphorylation of their components by several phosphatases. Several serine/threonine phosphatases, such as PP2A and PP2Ca, and tyrosine phosphatases, such as PTP-SL and HePTP, have been shown to inactivate MAPKs. Consistent with their critical roles in key cellular activities, including cell proliferation, differentiation, and survival or death, the MAPK signaling pathways have been implicated in the pathogenesis of many human diseases. Alzheimer's disease (AD) is a neurodegenerative disease characterized by cognitive and memory dysfunction that is thought to result from the formation in the brain of both senile plaques containing amyloid-β (Aβ) and neurofibrillary tangles containing the microtubule- associated protein tau. Evidence thus suggests that MAPK signaling pathways may contribute to the pathogenesis of AD through the regulation of neuronal apoptosis, β- and γ-secretase activity, and phosphorylation of APP and tau. Parkinson's disease (PD) is the second most prevalent neurodegenerative disease. Various observations suggest that MAPK signaling pathways contribute to neuroinflammatory responses and neuronal death triggered by α-synuclein aggregates or functional deficiencies in parkin or DJ-1 in the pathogenesis of Parkinson’s disease. Many of the cancer-associated mutations of components of MAPK signaling pathways have been found in Ras and B-Raf, both of which participate in the ERK signaling pathway. The ERK signaling pathway plays a role in several steps of tumor development. The phosphorylation by ERK of proteins such as myosin light chain kinase, calpain, focal adhesion kinase, and paxillin promotes cancer cell migration. Furthermore, ERK1/2 signaling regulates the activities and levels of Bcl-2 family proteins such as the pro-apoptotic protein BIM and the anti-apoptotic protein MCL-1, thereby promoting the survival of cancer cells. 2. Wortzel I, Seger R. The ERK cascade distinct functions within various subcellular organelles[J]. Genes & cancer, 2011, 2(3): 195-209. 3. Ramos J W. The regulation of extracellular signal-regulated kinase (ERK) in mammalian cells[J]. The international journal of biochemistry & cell biology, 2008, 40(12): 2707-2719. 4. Shaul Y D, Seger R. The MEK/ERK cascade: from signaling specificity to diverse functions[J]. Biochimica et Biophysica Acta (BBA)-Molecular Cell Research, 2007, 1773(8): 1213-1226. 5. Yao Z, Seger R. The ERK signaling cascade—views from different subcellular compartments[J]. Biofactors, 2009, 35(5): 407-416.